Originally named Horologium Oscillitorium by French astronomer Abbé Nicolas Louis de Lacaille in 1752, HOROLOGIUM the Clock was named in honor of the pendulum clock, invented in 1656 by Dutch astronomer and inventor Christiaan Huygens. This Southern Hemisphere constellation is quite difficult to see even with clear skies but is known for its vast array of galaxies and several notable variable stars. Neighboring constellations include Caelum, Dorado, Eridanus, Hydrus, and Reticulum. 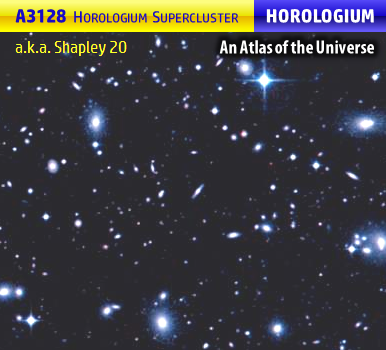 Home to over 300,000 total galaxies, the Horologium Supercluster gives advanced-telescope users the chance to witness over 30 galaxies with visible magnitudes of 17 or brighter (lower). 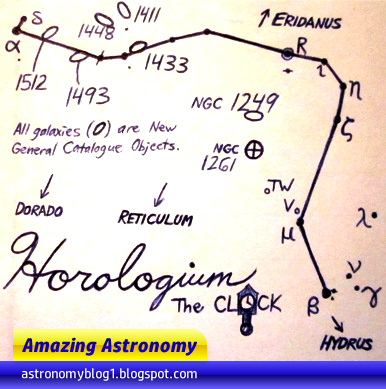 Prominent galaxies in Horologium include NGC (New Messier Catalogue) 1433, NGC 1448, and NGC 1512. According to the Constellation Guide website (↗), exoplanets are known to orbit three stars in Horologium as of the year 2017: Iota Horologii (ι), HD 27631, and TYC 8068-01208-1 (WASP-120). Iota Horologii is marked with a Greek letter ι (iota) in the constellation map above, while HD 27631 and TYC 8068-01208-1 are located near Alpha Horologii (α) in the northwestern section of Horologium. 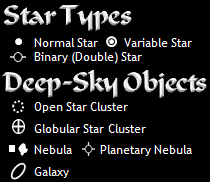 Variable star R Horologii (HD 18242) is known for displaying one of the widest ranges of brightness of all stars in the night sky. R Horologii's apparent or visible magnitude varies from about 4.00 to 14.30.